Select Schedule on the top ribbon of rybl.org. The schedule can be filtered to a specific age division and team. Also, games, practices, and other events can be filtered on or off. 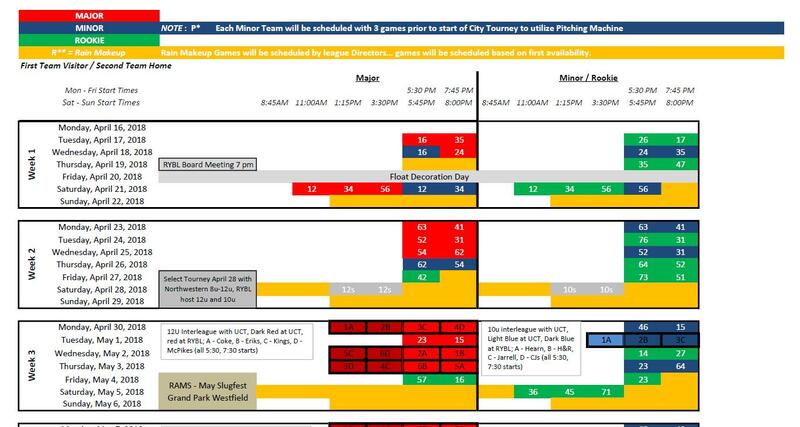 Also, the Combined 8U through 12U schedule in picture format can be selected in "Documents" or by clicking HERE. The T-Ball schedule can also be selected in "Documents" or by clicking HERE. Pictures are scheduled for April 9 and 10. Click HERE to find out the date and time for your team pictures.